Lately I’ve been a bit lost when it comes to writing from the heart, sharing my thoughts on Faith or self-improvement has felt like an obstacle was blocking, in a knee-jerk way. It’s felt like I was deep within a quiet period as I am facing some difficult times as we draw near to what I hope is the end of the legal end of my car accident. Almost as if I’m a turtle all pulled into my shell hiding in fear. It wasn’t until I was reading a post I wrote in 2011, Self-Improvement, taking a different path, that I realized what I have really been doing is hiding. This is a part of myself which I thought wouldn’t sneak up on me again. I’ve worked hard over these sober years to try and address this character defect….the one where I stick my head in the sand and ignore an issue. Fear is a funny thing, it’s not a fact nor is it tangible to anyone other than the person experiencing it. Personally I don’t usually realize when I’m afraid. I’ve become so conditioned over time to subconsciously avert the source of fear as long as possible that I don’t even realize it’s happening anymore. I’ve worked to understand my body’s responses, to pray and centre myself with meditation with God, to hone in on what is bothering me before it can catch me off-guard. In this particular case I dropped the ball but dammit I did realize it in the end and for me that is indeed progress. I didn’t take my fears and frustrations out on anyone. I just hid from it within myself, which isn’t good for anyone who is in recovery so as of right now I’m here baring my soul once again to keep myself accountable. I’m afraid because I cannot control everything in my life. I have to admit this to myself, accept it and have faith that God is there for me to turn this fear over to. You see, it’s not enough for me to acknowledge the fear…..I need to replace that fear with faith. My faith that God is larger, more powerful and capable than myself on any and every level. I’m so deeply grateful that I’ve found this kind of faith in my life, that I’ve remembered to turn to it rather than relying upon myself or others. The future is still unknown, but then it always is. The difference is that when I wake tomorrow I’ll give this fear of mine up to God again, and do it again and again until the fear dissipates and my faith stays with me every second. I will once again form the habit of constant dialogue with my God, wrapping myself in my faith that He alone can provide me with the security I’m seeking right now. In writing this I hope someone is touched, moved to explore their faith and see if they’ve allowed holes to appear like I have. I hope this helps someone come closer to this feeling of love surrounding me. I didn’t realize it until now people can have many fears in life, one of mine is going on escalators. I can understand that, my daughter is frightened of stairs. Thanks for sharing, it reminds me of the fears I face, and to remember to give them up. Thanks for what you are doing. Sharing your fears when you become aware of them is one way of facing them and it can lead to overcoming them. I love that you have found FAITH to help guide you in the right direction and more importantly, your positive outlook each waking moment that you put your fears into GOD’s hands and have FAITH in Him. I fell in love with you when I saw your first picture. Thanks for being brave and putting it out there. 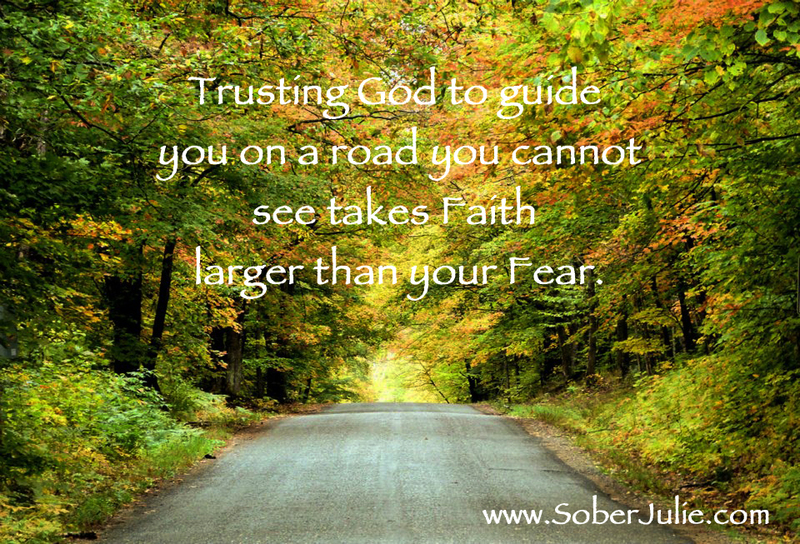 I am struggling with both faith and booze…..but I want to thank you for your blogs. Your words and heartfelt emotions are real and raw. I do have a few hundred questions to ask. The faith journey is new to me and my family (almost a year and we are such confused people that have luckily landed in an Episcopalian Church that not only hasn’t thrown us out, but seems amused by us) and the booze, well, I’m going back to middle school here. I am very functional (I guess, though I think it is less as time goes by) and also struggle with the whole addiction as a disease model. I am a seeker, though, so perhaps if I listen carefully, I will be guided what to do. I randomly picked this blog to comment on for a contest entry. Once again, God speaks to me through you and your journey. I am sitting here at my desk, in tears. ” I need to replace that fear with faith.” This one seemingly simple sentence has hit me like a ton of bricks. Thank you, once again, for allowing God to use you in such a way.